Benjamin Rush was born December 24, 1745 near Philadelphia. His great-great-grandfather John Rush was an officer in Cromwell’s army. In 1683 at the age of 63 he became a Quaker and emigrated from England bringing his children and grandchildren to Pennsylvania. Benjamin Rush was the fourth of seven children born to John and Susanna Rush. John Rush was a farmer turned gunsmith who died when Benjamin was only six. After his fathers death his mother Susanna was the sole support of the family. She opened a grocery that was so successful that she soon opened another shop selling chinaware. At the age of 9 Benjamin was sent to Nottingham Academy in Md. run by his uncle Samuel Finley who later became president of the College of New Jersey (Now Princeton University). Rush graduated from the College of New Jersey in 1760 at the age of 15. Rush studied under Dr. John Redman in Philadelphia for six years and in 1766 he traveled to Scotland to attend the University of Edinburgh. While in Edinburgh he helped his friend Richard Stockton convince Dr. John Witherspoon to accept the presidency of the College of New Jersey. He received a degree of Doctor of Medicine in 1768 and traveled to hospitals in London and Paris. In the summer of 1769 Dr. Benjamin Rush returned to Philadelphia were he opened a medical practice and was appointed professor of chemistry at the College (now University) of Philadelphia. He wrote the first American textbook on chemistry. In 1773 he contributed editorial essays to the papers about the patriot cause. He was active in the Sons of Liberty in Philadelphia and recommended the title “Common Sense” to his friend Thomas Paine for a pamphlet that became popular among patriots. On January 11, 1776 Dr. Benjamin Rush married Julia Stockton the 17 year old daughter of his good friend Richard Stockton of Princeton. The minister that married them was Dr. John Witherspoon whom he had helped bring to America ten years earlier. Six months later they would all sign the Declaration of Independence. In April 1777 he was appointed Surgeon General of the Continental Army and in July 1777 he was made Physician General, for which he would take no pay. He was with the army at the battles of Trenton, Princeton, and Brandywine and cared for the wounded. In 1778 Rush was critical of the administration of the Army Medical service under Dr. William Shippen. Rush felt conditions were deplorable and complained to General George Washington, who deferred to Congress. Congress ultimately upheld Shippen, and Rush resigned his appointments in disgust. After his term in Congress he resumed the practice of medicine and was a founder of the Pennsylvania Hospital in Philadelphia. Rush became president of the Philadelphia medical society, established the first free medical clinic for the poor, and continued to teach medicine at the College (now University) of Pennsylvania. 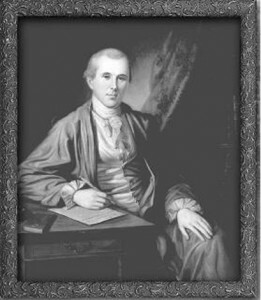 Dr. Benjamin Rush had become the leading American physician of his time. When Rush began teaching medicine at the University he had a class of twenty students; when he delivered his last lectures in l813, he had more than four hundred students. He was beloved in his city, where he set an example for other doctors in caring for the poor and became world famous because of his dedication to duty during Philadelphia’s two great yellow fever epidemics that killed nearly 8,000. He himself had a severe attack of yellow fever. He was honored for his contributions to medical science by medals and presents from the King of Prussia, Queen of Italy, and Czar of Russia. Rush was a social activist, a prominent advocate for the abolition of slavery, and advocate for education for the masses, including women, and for public clinics to treat the poor. He believed in providing treatment for the mentally ill, treating them with compassion and was known as the father of psychiatry. In 1789 Benjamin Rush wrote in Philadelphia newspapers in favor of adopting the Federal constitution. He was then elected to the Pennsylvania convention which adopted that constitution. He was appointed treasurer of the US Mint under President John Adams and served from 1797 to 1813. In 1808, the Philadelphia Mint struck two medals in his honor. Rush helped found Dickinson College and served as a trustee. He was a member of the American Philosophical Society and was cofounder and vice president of the Philadelphia Bible Society. Serving the people of Philadelphia during a typhus epidemic Dr. Benjamin Rush died April 19, 1813 at the age of 68 of typhus fever. They resided at “Sydenham” now Fifteenth Street and Columbus Ave., in Philadelphia. Julia Stockton Rush died at the age of eighty-nine on July 7, 1848 and is buried with her husband in Christ Church Cemetery in Philadelphia. Benjamin and Julia had thirteen children but four died in infancy. Richard Rush, the second son, served as Attorney-General of the United States, Minister to Great Britain, Secretary of the Treasury, Minister to France and was a candidate for the vice-presidency. James Rush, the third son was a medical authority and writer, and endowed the “Ridgeway” branch of the Philadelphia library. James’ wife was Phebe Ridgeway Rush, a leader of Philadelphia society and one of the most famous women in America at the time. In 1904 the American Medical Association dedicated a statue of Benjamin Rush in Washington, D.C. Among other honors in 1948, the Medical Society of Pennsylvania established a Benjamin Rush Award. A three inch bronze medallion bearing his profile is awarded annually to one layperson and one lay organization for outstanding contributions to the health of the citizens of Pennsylvania. In Washington, D.C., near the Washington Monument there is a memorial park to the signers with 56 granite boulders, each engraved with the name of a signer.